Powers/Abilities: The Brethren could transform into their true, muck-like forms. In these forms, their bodies were able to be shaped at will. Each of the Brethren were drawn to feed off of bacteria and germs to survive. 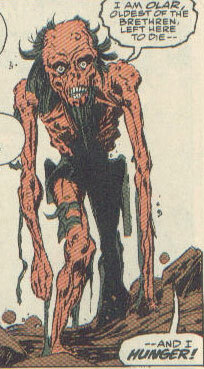 Individual Brethern possessed a variety of powers not displayed by the race as a whole (see individual descriptions below); whether all Brethern possessed the potential to develop similar powers to those displayed by the individuals (as is the case with Earth's Eternals) is undisclosed. Traits: Each of the Brethren possessed a true form that resembled a giant germ cell. This form was a brownish, amorphous form. History: (Avengers I#339 (fb)) - The Celestials used their genetic knowledge to transform primitive pre-human bipeds into the Eternals. The Celestials then foresaw a need for a control group in their experiments, a balance. The Celestials took the bacilli, the spirilla, the cocci, and other bacteria and germs from the planet Omega Climion Six, and formed the Brethren. The Brethren served the Celestials, awaiting each planet's judgment from Arishem the Judge. Upon a negative judgment from Arishem, the Brethren would sweep onto the unfit planet and destroy everything on it. The Celestials eventually lost interest in the Brethren and let them loose, allowing them to spread destruction throughout the universe (including the home of the Bruruthian Paramecium Rex), until the Collector found them and added them to his collection. (Avengers I#334 / I#338 / I#339 - all (fb) - BTS) - The Collector decided to use the Brethren to destroy most of humanity, allowing him to collect the last survivors. Bringing them into the Sol system, he allowed them to "escape" from his store, letting them believe they had badly injured him while doing so. (Avengers I#334) - The Brethren crashed their spacecraft into the Blue Area of the Moon. Karnak, Timberius, Quicksilver, and some of the Alpha Primitives went to investigate. Quicksilver decided to alert the Avengers, but when he activated his identicard, a force field erupted from the spacecraft and surrounded the group. Soon after, the Brethren announced their arrival , stating that for each planet they visited, native blood must be spilt. Not long after, Crystal managed to teleport to Avengers Mansion and alert the Avengers, who promptly made their way to the moon. Inside the force field on the moon, Thane Ector tortured Quicksilver in an attempt to gain the knowledge of what solar system they had crashed in. Sybil Dorn then claimed that Quicksilver's spirit could not be broken and that he could be one of the Brethren himself. Throwing him aside, Ector claimed that Quicksilver's genes were not worth preserving. Ector then returned to his spacecraft and commented to the Fool that the Brethren were tense since their victory and Quicksilver's sacrifice would have soothed them. The Fool replied that there was still much to learn from the world they had crashed on before they sacrificed anything. The Fool then suggested that Timberius of the Inhumans would be better to get information from, due to his fear of the situation. Ector agreed and the torture of Timberius began. The Thane tortured Timberius, breaking off many of the limb-like projections from his head, until Timberius revealed that Earth was more ripe for conquering than the moon that the Inhumans inhabited. Happy to hear that the moon orbited Earth, the first planet to defeat Galactus, Thane Ector once again battled Quicksilver, who was determined to prevent Ector from killing anyone. An Alpha Primitive who was trapped also within the force field jumped to save Quicksilver, only to be grabbed and killed by Ector. Just then the force field finally fell at the combined hands of the Avengers and the Inhumans, and Ector ordered the Brethren to destroy the intruders. As the Avengers and Inhumans battled the Brethren, Thane Ector, Sybil Dorn, and the Fool discussed their upcoming conquest of Earth. The Fool handed Ector an energy transmuter that would allow them to teleport away. Despite his annoyance at leaving a battle, Ector teleported the entire Brethren away. Once the Brethren took their leave, the Watcher appeared before the Avengers and the Inhumans, explaining that they had witnessed a rebirth of a great threat to the universe and that the Brethren once spread destruction on a cosmic level across the universe. The Watcher then led the Avengers inside the crashed spacecraft, where they discovered that the Brethren were escaped creatures from the collection of the Elder of the Universe known as the Collector. (Avengers I#335 (fb) - BTS) - Thane Ector made Earthfall and led the Brethren in several violent forays against major population centers; these raids caused mass panic across the world and the Earth's governments put their militaries on high alert. (Avengers I#335) - The Vision and Black Widow delivered reports on the Brethren's attacks to the rest of the Avengers. Widow then stated that the U. N. had granted the Avengers permission to act in any country facing a Brethren attack. After her report, Captain America noted that Thane Ector was exactly the type of threat that the Avengers were formed to stop, and announced that Thane Ector must fall. In Paris, Thane Ector, Sybil Dorn, the Fool, and a horde of Brethren creatures began their attack on the city. During the attack, Sybil questioned how soon Earth would fall before their might, given that their raiding parties had not even begun to start a conquest. Thane Ector grew angry at Sybil's questioning of him, but the Fool replied that she was merely eager. Ector suggested she listen to the Fool, but Sybil kicked the Fool, claiming that he was a throwback freak who should've been killed at birth. The Fool apologized, saying that he had forgotten his place as a fool to bow before his superiors. At that point, the Avengers arrived to stop Ector's raiding of France. Sersi blasted Sybil Dorn with energy from her eyes and then blasted Thane Ector, who shrugged off her attack and punched her to the ground. The Vision came to her aid, striking Ector while in his increased density form. Ector once again shrugged off attacks and knocked the Vision to the ground as well. Ector then explained that the Avengers had underestimated him and to prove himself, Ector vaporized a French military officer using his energy eye beams. After defeating Captain America, Thane Ector took Sersi as booty, much to the anger of Sybil Dorn. He then teleported away, with Sersi in tow. (Avengers I#335/2) - Combining their intellects, the Avengers Quasar, Black Panther, the Beast, and Hank Pym revived the Collector. 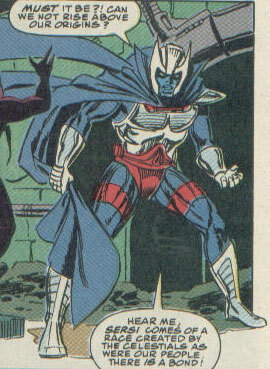 Upon his revival, the Collector revealed that the Brethren originally came from Omega Climion Six and led the team to investigate the eco-cell that originally housed them. Unfortunately, due to the Collector's muddled mind, he accidentally sent Black Panther, the Beast, and Quasar into the Bruruthian Paramecium Rex eco-cell. 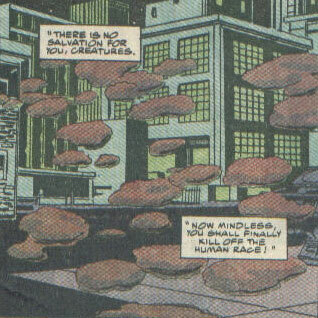 (Avengers I#336) - Thane Ector teleported his citadel onto the top of World Trade Centers. From his citadel, he projected an image of himself to New York, announcing that he claimed Earth for the Brethren. The Avengers soon arrived and battled the troops sent into New York by Thane Ector, where the team once again suffered defeat at the hands of the Brethren. Thane Ector viewed their defeat on a video screen, then explained to Sybil Dorn that when their time came, he would make sure the Avengers died honorable deaths. Sybil claimed that Ector alone deserved admiration for freeing the Brethren from the Collector's zoo. Ector then made his leave, angering Sybil, who accused him of going back to the "terran witch," Sersi. The Fool arrived and told Sybil not to worry and that Thane Ector had led them sure and true since their arrival on Earth. Angered, Sybil kicked the Fool. In Sersi's cell, she attempted to reconfigure the molecular structure of her shackles to that of flowers, but they always returned to their original state. Ector soon arrived in her cell and explained that the Avengers had once again failed to defeat the Brethren. Thane Ector then asked her to look at what they have in common. Ector revealed that he, too, was made flesh by the cosmic Celestials. The two then shared a kiss and Ector made his leave of her cell. Discovering Ector leaving Sersi's cell, the Fool angrily claimed that Sersi was not one of the Brethren and attacked him. The Fool then warned Ector to come to his senses, lest he be forced to kill him. Thane Ector heard this and wondered whether that was what he wanted, to die and not have to carry on the name of the Brethren anymore. Inside the Bruruthian Paramecium Rex eco-cell, the Avengers inside met up with the local Neolithic tribesmen that were housed there and, after a brief battle, explained that Thane Ector was threatening Earth. The tribal leader, Nakka, revealed that their world had once been lush, until the Brethren arrived and ravaged it. After hearing their story, the Black Panther deduced that the Brethren must've escaped at small size and traveled through the circuitry in the Collector's ship. (Avengers I#337) - One day after the arrival of Thane Ector's citadel in New York City, the Fool and Thane Ector investigated the sewers of New York, where the Fool fed off the muck inside. While the Fool was feeding, Thane Ector questioned the purpose of the Brethren's conquest. The Fool once again warned him of his obsession with Sersi and his admiration of the Avengers. The Fool then offered Ector some of the muck to feed on, which Ector denied, claiming that he was a warrior. But soon after, Ector reduced himself to feeding on the muck as well. Back at Avengers Mansion, Nick Fury contacted Captain America and explained that the autopsies of the Brethren's victims showed that they were devoid of any germs and bacteria. Inside Sersi's cell in Ector's citadel, Sybil angrily spoke with Sersi about how she was unfit to read the Brethren's history scrolls. Sersi then taunted Sybil until a fight broke out between the two until Ector arrived and attacked Sybil in defense of Sersi. After Sybil stormed out of the cell, Ector explained that the Celestials created the Brethren from the muck and mire. He revealed that the Brethren feed off the germs and bacteria to survive. While Ector and Sersi spoke, the Avengers inside the Collector's ship followed a trail of decay through the ship's vents and discovered the home eco-cell of the Brethren. Once there, the tribal leader Nakka decayed and died in front of the Avengers' eyes. (Avengers I#338) - In the Brethren eco-cell, Quasar was attacked by the oldest Brethren, known as Olar, while back on Earth, Sybil Dorn plotted to the Fool about killing Thane Ector. While Sybil plotted away, the Avengers present in the eco-cell were teleported to New York and met up with the other Avengers. Quasar then introduced Captain America to their prisoner, Olar. The Beast then informed Cap that they discovered that the Brethren were purely bacterial lifeforms and that they just looked humanoid. Inside Ector's citadel, one of the Fool's spy eye drones returned with news of the captured Olar, to which the Fool deduced that the Avengers would discover the Brethren's true nature. As Sybil Dorn called the Brethren together to accuse Thane Ector of treason, the Fool arrived and claimed that Ector had only consorted with Sersi to gain information. The Fool then showed the video footage obtained by his spy eye drone. Angered that the Avengers had allied themselves with the Collector, Thane Ector threw Sersi to the ground and announced to the Brethren that they must destroy the Collector. As the Brethren left, the Fool revealed his plan to Sersi to enrage Ector by showing the Avengers allied with the Collector. The Fool explained that the evidence would bring Ector back to the Brethren, as well as prevent the Avengers from gaining the knowledge of the Brethren's true nature, by having the Brethren destroy them. Soon after, Thane Ector attacked Avengers Mansion, prompting a battle between his Brethren and the Avengers. Thane Ector soon made his way to the Collector, whom he attacked viciously and then claimed that it was to end. The Collector referred to Ector as a pawn and explained that it had just begun. 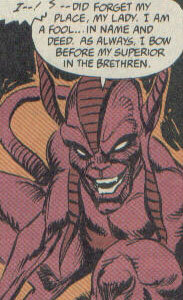 The Collector then blasted the Avengers and the Brethren, revealing his true nature. He then revealed that it was he who released the Brethren, he who brought them to Earth, and that the human race would die. (Avengers I#339) - As the Collector stood above the fallen Thane Ector, the Avengers and the other Brethren watched in horror. The Avengers quickly reacted, attacking the Collector, only to be forced aside. The Collector then revealed that his plan was the once again attempt to add humanity to his collection zoo. He then explained that his addition would be a truer prize were they the last of the terrans, which was why he released the Brethren to destroy humanity. Thane Ector responded that it was the Brethren who escaped him and it was their initiative. The Collector replied that he had allowed their escape and controlled everything. While the Collector was monologuing, the Fool teleported himself and Sersi to the center of the battle so he could have her watch as his plans came to be. Upon discovering the Collector's plot, the Fool began to worry until Sersi knocked him out with a punch to the head. Sybil Dorn claimed that the Brethren were warriors born, at which point the Collector revealed to everyone their true history. Upon hearing this history, Sybil claimed that the Brethren were people and asked Ector to tell him. When she looked at Ector, she realized that the Collector was right and that the Brethren existed in truth, as germ creatures. Realizing that she had misjudged Thane Ector, Sybil embraced him, claiming that she would be there for him forever. Bored with her pledge of fidelity, the Collector vaporized Sybil Dorn with a blast of cosmic energy. The Collector then began to use his cosmic powers to transform the Brethren to their true forms, allowing them to mindlessly feed off of the Earth. The Avengers quickly jumped into action once again, destroying the bacterial forms of the Brethren to prevent them from spreading across the globe. Sersi found Thane Ector and explained that the Brethren were more than just bacteria, at which point they heard the crying of the Fool, who was in telepathic contact with the disembodied Brethren. Thane Ector took it upon himself to comfort the upset Fool. Noticing the Fool's telepathic contact with the entire Brethren, the Vision deduced that the Fool was experiencing a collective will, similar to the Eternals' Uni-Mind. Vision asked Thane Ector and the Fool to aid him in his idea to create a Brethren Uni-Mind. As a Uni-Mind, the Fool could reason with the disembodied Brethren and tell them that there was no point in decimating the Earth. Captain America then ordered most of the Avengers to keep the Collector occupied, while Sersi generated a force field around Ector and the Fool. Inside the field, Sersi aided Ector and the Fool in pulling the disembodied Brethren into the form of a Brethren Uni-Mind. The Uni-Mind then reached out towards the Collector and pulled him inside itself, causing the destruction of both the Uni-Mind and the Collector (at least, for the time being). With the Uni-Mind destroyed, the Brethren themselves were also destroyed, as they could not exist without the consciousness. As Thane Ector died as well, he commented on the death of the Fool and how he would've liked to known the feeling to heal instead of destroy a while longer. As he passed, Sersi kissed him goodbye. Comments: Created by Bob Harras, Andy Kubert, and Tom Palmer. Olar created by Bob Harris, Steve Epting, and Tom Palmer. Throughout the "Collection Obsession" storyline that ran from Avengers I#334-339, Sybil Dorn was called both "Sybil Dorn" and "Sybyl Dorn" by various people. She was mostly called "Sybyl" by her fellow Brethren Thane Ector and the Fool, although in #334, they too, called her "Sybil." Sersi also called her "Sybil" at one point during the story as well. I went with calling her "Sybil" in this profile because it was the first name she was referring to as and since it was Sybil's first appearance, I am going to assume that her creators knew what her actual name would be. The Brethren received an entry in the All-New OHotMU Update#3. Sybil Dorn was one of the Brethren who crashed on the Blue Area of the Moon. She often questioned Thane Ector's reasoning behind his conquest of Earth, much to the anger of Ector. She angrily accused Ector of treason when he befriended Sersi, but she eventually saw the truth. She was killed by the Collector after realizing the true nature of her race. Sybil Dorn could project vaporizing energy beams from her eyes and could also transform into a muck-like form that was amorphous. Thane Ector was also one of the Brethren that crashed on the Blue Area of the Moon. He was also the leader of the Brethren and was bred to be the most perfect of warriors, in his own words. Due to his knowledge of the Brethren's true nature, he eventually grew tired of conquest. Thane Ector had an unknown degree of superhuman strength and durability, sufficient to give Sersi a run for her money and withstand punches from the Vision at an increased density. He could also project energy beams from his eyes, strong enough to vaporize a human. He was seen generating shockwaves by pounding his fists to the ground, but this may just be attributed to his superhuman strength and the force at which he was hitting the ground. The Fool arrived with the other Brethren when they crashed on the Blue Area of the Moon. The Fool seemed mostly concerned with the Brethren's conquest of Earth over anything else, until the Collector disembodied most of the Brethren. He eventually aided Thane Ector in creating the first Brethren Uni-Mind. The Fool had telepathy, which allowed him to be in telepathic contact with his fellow Brethren. He could also use his telepathy to project painful blasts of mental energy from his mind. Olar was the oldest of the Brethren. He was left behind when the other Brethren teleported to Earth. He was killed by the Fool to prevent the Avengers from discovering the secret of the Brethren's true nature. Olar could extend muck-like tendrils through the ground that could entangle others. Presumably, these tendrils were a part of his amorphous muck-like form that was shared by each of the Brethren.